By choosing our BigCommerce integration, you can smoothly add LiveChat to your website and get a bang out of talking with clients since the first minutes. Deliver efficient assistance and boost customer engagement at the same time. BigCommerce is an e-commerce platform that allows you to create and customize a website to your liking. It comes with a wide set of customizable templates and detailed e-commerce analytics. You can also easily manage shipping and payments, and even list your products on Amazon. What's more, BigCommerce lets you sync your inventory with Facebook Shop, Pinterest, eBay, and Square POS to process all your orders from a single location. It integrates with PayPal powered by Braintree, Stripe, Apple Pay, Pay with Amazon and dozens more — all with low rates. To add to this, according to the research created by Ipsos, BigCommerce merchants grow 28% year over year. Surely, it's a platform worth using! When it comes to our BigCommerce integration, plug and play is the term that comes to mind. All you gotta do is to copy our ready-made code and paste it into the dedicated module provided by BigCommerce. It's that easy! What's more, we provide a tutorial as well. LiveChat for BigCommerce not only adds chat to your website but also provides you with a free of any additional charges ticketing system – because we know that your customers like to be covered 24/7. Using LiveChat to talk to customers helps you understand their needs and wants. You can use that knowledge to recommend similar products and services to increase the average order value. With LiveChat, you can have a direct contact with customers that allows you to maintain and improve loyalty to your brand. 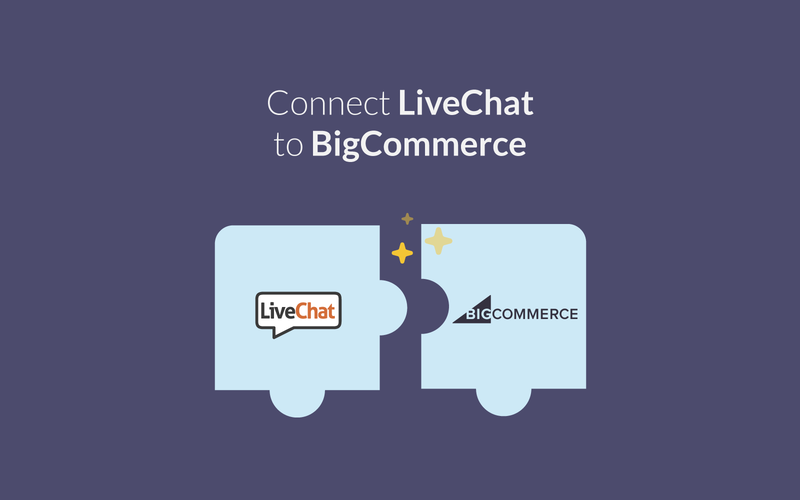 Start using LiveChat with BigCommerce now!